I had been looking online at curtains for the library. I know everyone always says that they love the ones that are up there now, but I don’t. I’m looking for a bold, graphic print that has brown and mustard yellow in it to work with the wall colors, but I didn’t find anything I really loved (these came closest). I had given up for the night and figured I’d look again in a few months when there might be some new options on the market. Then, I had a dream in which the perfect solution presented itself to me: I want curtains made out of Orla Kiely stem print fabric! Too bad it doesn’t seem to be available. Wah-wah. Previous Post Up for the Challenge: We Won! Oooh love that! Hopefully it becomes available soon! That Orla Kiely pattern for curtains would definitely be perfect for the library. I love her stuff! Try some of the new Moda lines that just recently came out – they’ve got some more of the earthy colors in them. Could you buy some duvet covers and make curtains out of them, or would the sizes be all wrong? Please contact Orla Kiely to see if they have any plans on producing fabric or window treatments. I have been looking for the same thing. I would even be willing to sew my own window treatments. I’m sure they would respond to YOU!! !Don’t they know how important you are and the huge following you have? I’m hoping you’ll have some pull. So maybe you can have your dream curtains, after all!!! If the Duggars got anywhere me, I think I would have to move. They freak me out with their crazy perm mullets. And a decor redo from them would be what nightmares are made of! i’d check ebay, i’ve seen the stem print duvets there. or what about creating a stem-like pattern on spoonflower? I know the last thing you may have time for is to sew but these fabrics are great. Amy Butler » Garden Maze Tan, Patty Young » Flora Kiwi, Tina Givens » Silhouette Polka Pink as ideas. Good luck. ME TOO!!! i have some plain cream colored panel curtains that i thought about screen printing or appliqueing a similar pattern onto them myself, but that’s just too much work right now. good luck, i know how it feels to dislike something about your home, ugh. so frustrating to look at every day. I hate when you have a vision and have a difficult time making it happen! I think Ebay might be a good place to start. What about the Orla Kiely table cloth at Target? Those mustard stems would have been perfect! I’ll let you know if I find a current source. Barring that, have you considered any of these Marimekko prints? Love the idea!!!! Not of the Duggars…but of the curtains! But now my question is…where to find that amazing sofa the pillows are on?!?! Gorgeous. You know with your mad skills, why not design your own using spoonflower? I have been searching for that print in curtains everywhere…I even got desperate and searched Target stores for a tablecloth in that print, but all they had was the Orla flower pattern…not really what I’m looking for. Have you checked Ikea? I remember a few years ago they had a similar stem print as blinds or it might have been fabric but can be used to make blinds. Hi Nicole….congrats on your gorgeous little family and winning the BHG competition…much deserved! Been following your blog for a long while now, love it! I have a question…might seem silly or basic but how did you do/how do you do the pattern/print overlay in your photo above? I want to try this effect on some Wedding pics by adding a transparent lace overlay…any info or advice from yourself or your readers would be much appreciated. I love Orla Kiely. I bet they are going to make the curtains after reading your blog. With your winnings from BHG you can make print your own fabric at Spoonflower.com and get exactly what you want. I must say I am not nor ever have been a fan of Keilys. But I think those curtains would be divine in your space. Go with the duvet idea! That is too bad. Those would look great in curtains! I say design your own (or find something from ikea – they tend to have great graphic prints in those colors). YOu can create your own printed frabic at Spoonflower. I am wondering where you look when you shop for curtains. I feel like I see the same things everywhere, but it is most likely because I don’t know where to look. I don’t know much about design, but I would love to have a beautiful space with a little more personality that I have found so far. Thank you! Now that you have BOTH hands free you could paint your own curtains–HE HE!!! The style looks lovely, and I’m impressed that you are still finding creativity and inspiration despite perhaps having what I like to think of as “breastfeeding brain.” In other words, a bit more tired and out of sorts. Jenny, there aren’t that many great places to look for curtains (that I know of at least). Anthropologie is always good, and then I just look for good fabric since I don’t mind sewing my own. Bridget, the photo came that way, but you can do that in Photoshop with layers and adjusting the opacity. Anna, I was thinking Marimekko too! I just haven’t found THE one yet, you know? make some w/ anna maria horner fabric!! I think this looks nice and it has the colors you’re looking for. That’s too bad :( I have also been on a mad hunt for curtains lately. I finally settled for simple white ones until I find something I really love. The scary part about this post was finding out about the Duggar family…..I had thankfully not been aware of such a spectacle until now, but YIKES. Here’s to hoping you sleep better with some decent window dressings…. Nicole, I made curtains for my kitchen out of the flower tablecloths she put out for Target. I don’t think her stuff is still available at Target anymore but I’m sure a scan of Ebay might pan out. Although, I don’t know if the rectangle tablecloth is big (long) enough, although you could use solid color fabric with it to make it longer. I love the Orla Keily fabric, but I just feel like it’s sooo over used, you know? Well, since you love it and want it, I guess you don’t know. I have some of the flower patterned dish towels she had at Target that I love and get compliments on — the patterns are iconic! Just, in the design world, definitely known. Kind of like an Eames lounge chair (droool). I know you will not give up! I look forward to seeing & reading how you have made your dream a reality. Good luck! And congrats on the big win!!! Yay! Perhaps you might want to use the curtains that you made for your office in the library and then make new curtains for the office? I didn’t read through all of the comments here, but have you considered using flat sheets? There are tons of awesome sheet prints and they make nice curtains. Just a thought. Good luck on your search! um, any idea what that red sofa/loveseat in the picture is? I love Orla Kiely stuff. It’s a pity you can’t get what you want. Keep on looking though! oh I love orla! did you see her studio tour over on the guardian? super fun! On TreeFall Amanda used a duvet as curtains, maybe that’s an option? funny you should have this dilemma… i felt the same way about my curtains last week… i used an orla kiely tablecloth from target http://mytinyrobotheart.blogspot.com/2009/06/tuesday.html i only bought one at the time (who knew they’d end up on the window!?!) but am now stalking some on ebay. 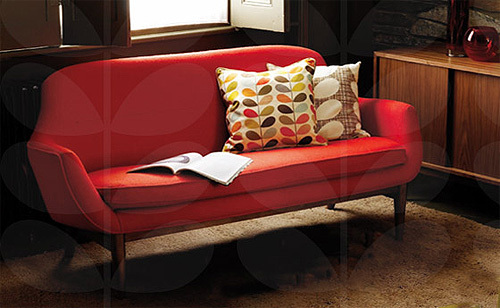 The couch is an Orla Kiely design sold through Heal’s in London. Oh, I forgot to say, why don’t you buy the rug in the multi-colored stem design, and then find other fabric for the curtains? Also sold through Heal’s of London. Making it Lovely | Transforming the so-so. » Blog Archive » Are These Curtains Better? I think the brown and white curtains give a more quiet or restful quality to your lovely library. buy the duvet and have or make curtains from it. I know you found curtains but I just came across stem print fabric! Maybe you could use it for something else. It’s a little pricy but it’s Orla and lovely!